I have just started using OpenStudio on a 4k monitor and found that the graphical user interface elements do not appear to be scaling correctly. All of the buttons are super tiny and hard to click. Is there a setting or configuration file I can change to scale the interface elements? After following @Aaron Boranian's answer I discovered an easier work around. 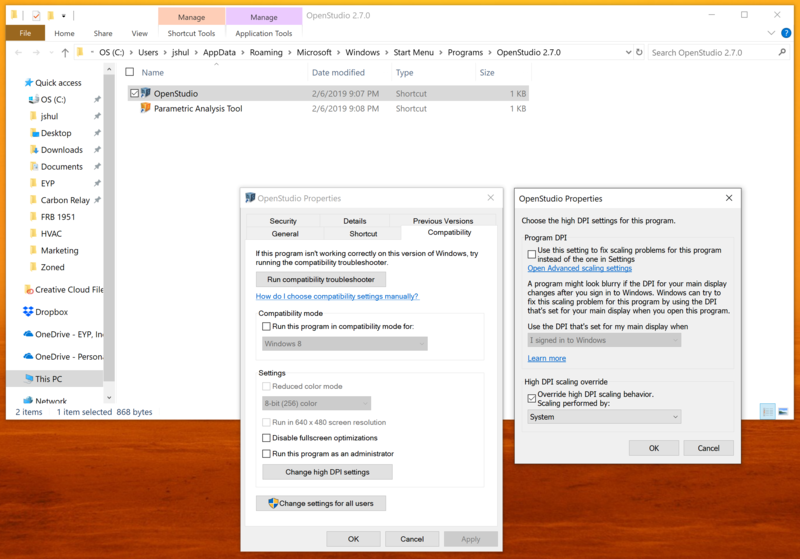 Find either your OpenStudio shortcut or OpenStudio.exe file. Right click the file and select Properties. Click on Compatibility tab at the top of the properties window. Select Change high DPI settings. At the bottom, under High DPI scaling override, check the box that says Override high DPI scaling behavior. Change the Scaling performed by: drop down to System. There is a way to tell your machine how to scale resolution for specific programs. The link below explains the steps, and comes with a video tutorial. Aaron, thank you for the response. That worked like a charm! In the comments to the above article, the author notes that Windows 10 has built the fix in by right clicking the application > Properties > Compatibility > Change high DPI settings > (at the bottom) Check Override high DPI scaling behavior > Scaling performed by: System. If you have to manually create an app manifest this seems like an oversight or bug in OS. Has anyone filed an issue with them? @dhollman there seems to be a DPI-related issue posted on OpenStudio's GitHub page. Feel free to add, vote, etc. to show the OpenStudio team that this should be higher priority (no activity since the issue was posted). This issue was more easily solved by changing the compatibility options in windows under properties and change DPI settings. See this image. I changed my computer's display resolution to lower value when I had this issue. Thank you for your suggestion. I would hate to use a lower resolution just so that OpenStudio displays correctly. I hope there is a better solution but I will keep your's in mind. Is it possible to add multiple air loops to one thermal zone?